ELDER (Sambucus nigra). Hedging Plants, Trees, Shrubs and Conifers. Av. Growth/Year* = Average growth per year in first 10-20 years, click here for more details. 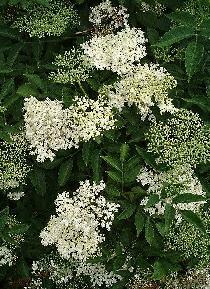 Fast growing native deciduous shrub with large clusters of creamy-white flowers in June followed in autumn by large bunches of shiny black elderberries. Can be grown as a shrub in a wild area or put in a mixed native hedge. Both flowers and berries are widely used to make delicious wines and cordials. Elder grows well by the sea. It is rarely eaten by cattle. SHRUB 12ft x 15ft (3.7m x 4.6m). Br = Bare rooted cutting, layer etc. We can only sell bare-rooted plants when they are dormant. Orders for bare-rooted plants will be sent when the plants are dormant again (depending on the weather this is normally in November). We still have a wide range of pot grown and cell grown plants available for despatch or collection. We don't charge your credit card for goods until they are about to be despatched. Orders received before October will be charged at this season's prices. We process orders on a first come, first served basis so to get your plants as early as possible please place your order now.